If you’re looking for cheap HP Color LaserJet CP1025nw toner, you’ve found it! Here at 1ink.com, our prices may be low, but our quality is on par with original equipment manufacturer (OEM) products. Every time you print a photograph or text document, you’ll see the quality evident on each page. These cartridges install just as quickly and easily as OEM HP cartridges, making your office operations smooth and productive. You’ll even get the same page yield and other print specs, all for a low price that’s over 50% less than the OEM retail cost! Remanufactured replacement HP 126A toner from 1ink.com is perfect for your office. We’ve taken every consideration to make this cartridge function like an OEM product and produce the same results. 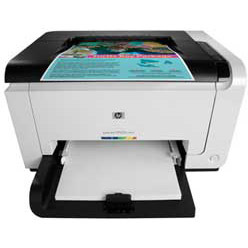 It will still allow you to get the same 17 ppm (pages-per-minute) print speed from your HP Color LaserJet CP1025nw printer toner as well as the same vibrant color print work and striking monochrome pages. Take a look at our selection of remanufactured replacement toner below and find the deals you’ve been waiting for!